Website & Graphic Design by Alev. Programming and Database by Richard. The Boulder Valley Care Network (BVCN) is a large network of health care professionals who are working together in order to improve health care for our community. We are comprised of three hospitals, several clinics, and over 700 physicians and other clinicians. 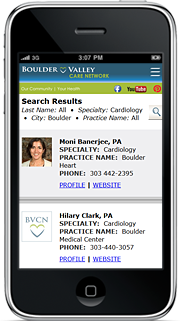 A custom Search Engine and Microsoft SQL Database for the BVCN provider network. 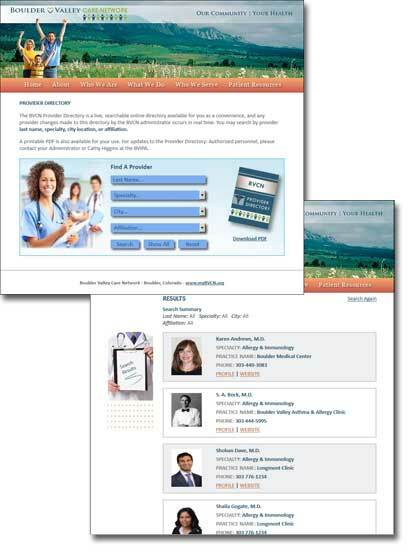 A CMS that enables BVCN employees to easily update content. All website design and development services.